Constructed as part of the 1960s renewal and modernisation of Sydney, the State Office Block was an innovative and eye-catching addition to the city’s skyline. Fifty years later, discussion continues around the heritage value of the modernist skyscraper and the divisive decision to knock it down. The State Office Block was, briefly, the tallest tower in Sydney. Opened in 1967, the skyscraper housed public servants in column-free, contemporary modular offices for 30 years. Architect Ken Woolley’s ground breaking design responded specifically to Australian conditions by incorporating innovative sun protection measures. Each concrete floor slab projected beyond the window line to form sunhoods. These were clad in glare-reducing bronze sheeting that weathered to a dark brown, giving the building its nickname, the ‘Black Stump’. The building’s interior was similarly pioneering yet practical, influenced by Scandinavian modernism and equipped with efficient modular furniture. When government policy shifted in the late 1980s to leasing rather than owning office space, however, the building was proposed for sale. Then Premier Barrie Unsworth dismissed its significance, saying: ‘We will always retain our heritage buildings but there is no real reason why we should retain the State Office Block’ (Daily Telegraph, 27 April 1987). Despite heated public opposition, by the 1990s the skyscraper was considered old enough to be outdated, yet too young to be of heritage value. It was demolished in 1997. In the same year, construction began on the State Office Block’s replacement, Aurora Place. The former State Office Block marks a double anniversary in 2017 – 50 years since it officially opened its doors to government office workers, and two decades since it was demolished. 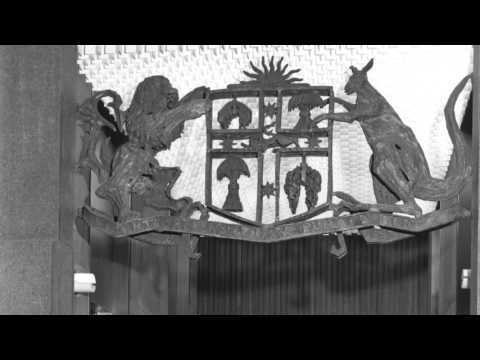 Listen to Nicola Teffer, curator of Demolished Sydney, Ian Innes, Director of Heritage & Collections at Sydney Living Museums, and Peter Poulet, New South Wales’ 23rd Government Architect, as they discuss the history, design, and continuing heritage debate surrounding the demolished office tower. To learn more about the State Office Block, join our expert panel on 2 April at the Museum of Sydney as we explore the challenges of conserving late-20th century buildings, interrogate changing fashions and ask why we place value on some aspects of our built environment and not others. Demolished Sydney is on show at the Museum of Sydney until 17 April 2017. Demolished Sydney is an exhibition exploring the buildings that once shaped the city’s skyline, from the grand Garden Palace to the monumental Pyrmont incinerator.